Pandemonium reigned at the monthly meeting of the Panadura Pradeshiya Sabha on Tuesday, over the issue of a devalaya built on the roadside in Wadduwa. 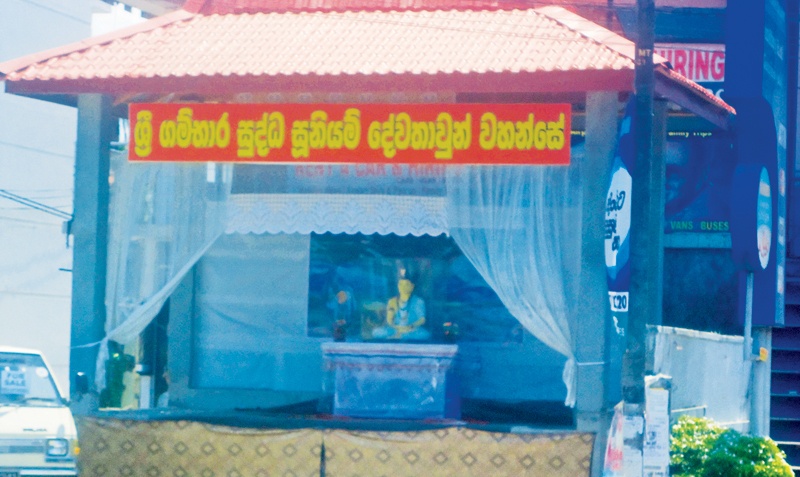 SLPP and SLFP councillors in the SLPP-controlled PS had a verbal argument over a shrine to Huniyan Devi constructed on the roadside of the Galle Road in Wadduwa town, by a kapusamy of a Suniyan Devalaya in Habaralagaslande, with the permission of the PS Chairman. Viharadhipathi bhikkus in Wadduwa were against the construction of the shrine as they said it created a religious conflict, and wanted it removed. SLPP councillor Krishan Perera on behalf of two bhikkhus had introduced a resolution to remove the shrine and requested the Chairman to take it up early as the bhikkus who were seated in the gallery had to attend the dana (mid-day meal) at their respective temples, in time. An argument broke out between SLPP and SLFP councillors when the Chairman refused to take up the resolution. Viharadipthi Nayaka Theras led by Dr. Dhammananda of Mollidgoda Pravachanodaya Pirivena, Ven. Hedigalle Vajira Adikarana Sanganayaka Thera of Bavana Center in Thalpitiya, Kivipathi Ven. Nelum Dhande Nayake Thera of Vivekaramaya, Maha Wadduwa, Ven. Devundera Nanda Rathna Nayaka Thera, Thalpitiya Adikarana Sanga Nayake Ven. Chanderathana of Dhaladawatte Temple, Thalpitiya, bhikhus of Panadura South Sasanaraksaka Mandala, who were in the gallery, then left in protest. Thereafter SLFP Councillor and PS Vice Chairman Upendra Silva said the Chairman had issued an unauthorised order to place a statue of a god on the side of the Galle Road in Wadduwa town, creating a religious problem. The kapusamy had obtained the permission of the Hindu Affairs Ministry and the Chairman to construct this shrine. The Bhikhus and the WadduwaTharuna Bauddha Sangamaya had submitted a report to the Panadura Magistrate’s Court under the Public Nuisance Ordinance.